Take a break from the heat with daily casino gifts and slot tournaments at CasinoPop. 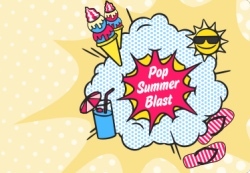 The Pop Summer Blast promotion is here, and it will keep you entertained and refreshed all summer long. Keep reading to learn everything you need to know about this two months casino extravaganza! CasinoPop is one of the best UK casinos when it comes to generous promotions and unique reward systems. Every time you level up you’ll get a PopSpin that can be used to win wager free casino rewards, and as your account level increases, so do your rewards. Another cool feature are the slot tournaments, where the casino hands out big amounts of bonus spins and epic spins every week! During the Pop Summer Blast promotion, there’s a new tournament starting every single day. A fresh competition starts at 18:00 CET daily, and a total of 2000 epic spins and 500 bonus spins will be handed out every week. Play some of the most popular slots in the games lobby, and see if you have the luck that is needed to defeat the other players. For more information about the slot tournaments, head over to the promotion pages at CasinoPop. Mondays: Mondays are bonus spins days at CasinoPop, and you can always expect to get heaps of spins on a new slot each week. Make a deposit, and you could get spins for the next three days! Wednesdays: between 16:00 and 18:00 every Wednesday it’s happy hour, so head over to the rewards section on your account and get more bang for your buck. Don’t miss it! Fridays: it’s Mystery Friday, and anything could happen. Exciting promotions, reload bonuses or bonus spins - whatever it is, you’re in for a serious weekend treat. These promotions are available 52 weeks a year, and you can always see the schedule on the PopZone page if you need a reminder. Click on the link to visit CasinoPop, and you could be winning your first tournament tonight - and don’t forget about the sweet welcome bonus that is available to new players!